코파카바나 해변에서 2블록 거리에 위치한 Augusto's Copacabana Hotel은 산토스 두몽 공항에서 8km 떨어져 있으며, 일광욕 테라스가 딸린 탁 트인 전망의 옥상 수영장과 피트니스 짐 등의 레저 시설을 보유하고 있습니다. Augusto´s Copacabana Hotel은 중심적인 위치를 자랑합니다. 투숙객은 상징적인 그리스도 상을 방문하거나 식물원을 산책하실 수 있습니다. 호텔에서 3km 이내의 거리에 위치한 리오 술 몰(Rio Sul Mall)에서 쇼핑을 즐기셔도 좋습니다. Augusto´s Hotel의 넓은 스위트는 전통적인 디자인과 가구로 꾸며져 있습니다. 모든 객실에 에어컨, 케이블 TV, 미니바가 구비되어 있습니다. 호텔은 매일 크루아상, 케이크, 계절 과일 등으로 구성된 아침 식사를 제공합니다. 세계 각지의 요리를 선보이는 레스토랑 겸 바에서는 맛있는 칵테일을 드실 수 있으며, 24시간 룸서비스도 이용 가능합니다. 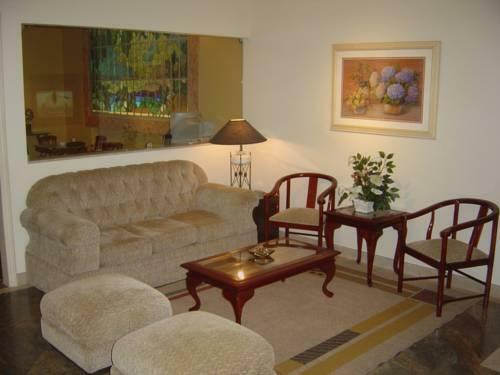 Augusto´s Copacabana Hotel은 이파네마 해변과 H 스턴 박물관(H Stern Museum)에서 모두 2km, 갈레앙 공항에서 19km 거리에 있습니다. 브라질 연방법 8.069/1990에 따라 18세 미만의 미성년자는 부모 또는 지정된 보호자 동반 없이 호텔에 체크인할 수 없습니다. 미성년자가 부모 이외의 성인을 동반하는 경우, 해당 미성년자의 호텔 체크인을 허락하는 서면 동의서를 제시해야 합니다. 해당 동의서는 양쪽 부모의 서명을 모두 받은 후 공증 절차를 거쳐야 하며, 공증 받은 부모의 신분증 사본도 함께 제출해야 합니다. 18세 미만의 모든 미성년자는 본인 및 부모의 신분을 증명할 수 있도록 사진이 부착된 유효한 신분증도 제시해야 합니다. 해당 사항은 미성년자가 부모를 동반하는 경우에도 동일하게 적용됩니다. 미성년자가 부모 중 1인만 동반하는 경우, 나머지 부모의 공증된 서면 동의서와 공증된 신분증 사본을 함께 제시해야 합니다. This is one hotel you can find the amenities close to it, supermarket, moneychanger, shops and metro. The stay itself is pleasant, apart from the premium that was being charged due to the world cup the hotel is nice. 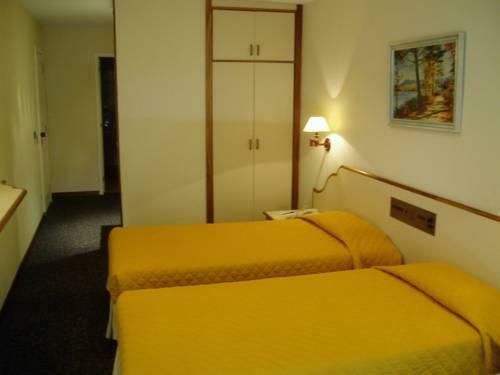 The best thing about this hotel is the location, it is close to the beach (about 200m) and it is tucked along a small road connecting to the main road. There is a supermarket about 50m towards the beach/main road. Moneychangers are available along the main road. Location. Helpful & friendly staff. Good breakfast. Stayed for 2 weeks, hotel and location was an ideal base, close to beach and convenient for sight-seeing, staff were friendly and helpful with plenty of information and advice for solo traveller during Carnival. Hotel and room had all necessary requirements and usual services plus a fresh breakfast. Definitely this hotel is located very good place. very close to the Copacabana beach. Due to this, price is high. I was very dissapointed with my bath room. It was very poor tap water condition for both cold and hot. I even couldn't wash my face!! This was unbelievable. Also, my friend called to my room, but he could hear my voice, but i couldn't hear his voice!! So, he asked the hotel to change the phone in my room. So I expected that the hotel staff to bring new phone to my room by noon on the next day, but they didn't. So, I went to the reception, to ask to bring the new phone immeditately. Then, finally they changed my roon phone. The hotel is very old and the rooms definately need an upgrade. The pool and spa were too dirty to swim in and there was no one posted upstairs for towels etc. The staff for the most part were very friendly and the hotel is located in the perfect spot for visiting Copacabana and the markets. They could also do with a second lift, you have to wait along time for it to come and it is small so only 2 people and their bags can fit in at a time. I would have epected a little more for the price comparing it with other hotels throughout South America. Overall the stay was pleasant but not ideal. 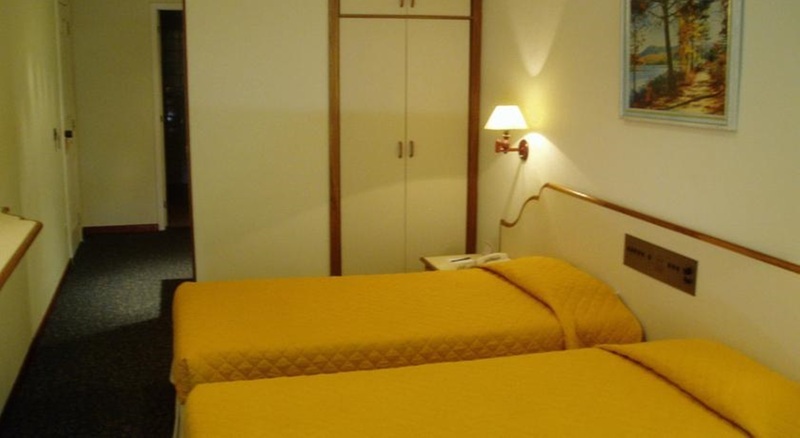 this hotel is loctated just near the beach of copacabana, walking 3 blocks away can reach the famous beach, the sea wave is very high and exciting. but the hotel is too expensive, everything must be paid, even the safe which has pay 4 reals. the worst thing is AC which is too old and noisy, you can sleep if it is on. terrible. Nice breakfast, Near the Copacabana beach. This hotel is definitely not 4-star hotel. I would rate it 2-star. 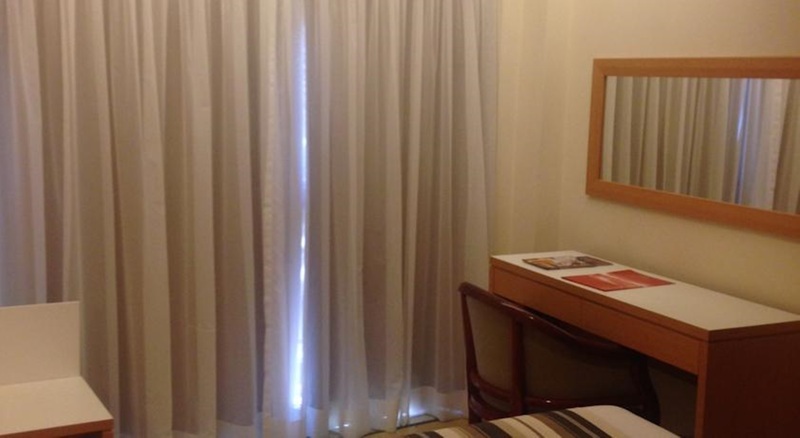 Room is quite small, located 2 blocks from Copacabana beach, not far from subway, bus stop. Hotel is quite old. Internet charge is R$6 per hour or R$15 per day, but signal is not very good, often cut off. Room is not very clean. Staff is quite helpful even they don't like smiling. this hotel is ideal for a stay in the fabulous city. 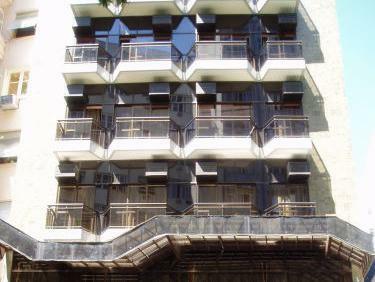 it is reasonably priced and right in the centre of copacabana life. it is surrounded by restaurants and bars but you can also stay in if you are shattered. Hotel is clean and pleasant with a roof top pool with a great outlook. room was fine as was bathroom. Breakfast buffet was also good in a lovely dining room.Practically next door is a cheap laundry so avoid undue hotel charges. A great "per kilo" buffet restaurant is down the road, on the way to the Beach, opposite a kosher deli. The hotel staff are helpful. The reception area is reasonable. The two rooms I had were very dated and run down. Room cleaning was only average. I had to call a cleaner back to remove dust from a shelf that had not been cleaned prior to or during my stay. I reserved and paid for a non smoking junior suite with a balcony. These only come with single beds!! Where in the world would you find a junior suite without a double bed? I was down graded after the first night but the hotel refused to reduce my rate for the remaining 7 nights. This was disappointing and left a very sour taste in my mouth. The breakfasts were very restricting for me as I do not eat animal products. I managed to find milk and preservative free bread in the supermarket and health shop and ate that at breakfast. one suggestion - use an internet cafe though as its a lot cheaper with more seats available. oh and use a local laundry too - v easy to do. I liked this place since it was very close to the beach and not noisy at all in nighttime. The price was also good. Great location. Good price. Very clean rooms. Unfriendly staff. old and annoying Air conditioners. Good localisation. Good price. Clean rooms. Nice localisation about 500m to the famous copacabanabeach. Dirty pool - is not usable. Poor breakfast. Receiption staff is very unfriendly! They charge you to use the safety box in your room!! A basic hotel but not too expensive given the comparisons in Copacabana. They are a bit penny pinching though, charging you to use the internet and even the safety box in your room. You have to sign a form indicating you refused to pay for the safety box, which doesnt inspire confidence about the security of your items, but luckily nothing of mine was taken.